The mythical Herobrine, a ghost supposedly haunting Minecraft, is usually depicted building creepy structures, standing around menacingly, and being all-around unpleasant. But here, he's more of a legendary warrior god. The video, called Gods Don't Die, was done by animator Dillon Gu. He's quite talented, so if you haven't seen his stuff yet, make sure you check him out. 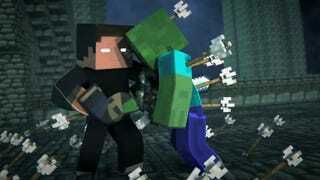 The gist of Gods Don't Die is that Herobrine is trying to survive the attack of an army of Minecraft monsters, who presumably are tired of having him be the scariest NPC in the game. This one's actually a sequel. Obviously you don't need to watch the first video to enjoy the second—it's not like there's a huge, overarching plot to follow—but if you want to have a look, here's the prequel, Gods Don't Bleed, released two years ago. It's a bit shorter, but it's still pretty good. And here's Gods Don't Die. It makes the earlier one look kinda, well, weak in comparison. But that's just what two years' extra experience does.